A month ago the New York Times insulted its subscribers with a climate change column by Bret Stephens, their new hire from the Wall Street Journal. The bizarre text was mostly a sequence of claims that did not follow from the arguments presented. Anyone who has read the 2014 report of the Intergovernmental Panel on Climate Change knows that, while the modest (0.85 degrees Celsius, or about 1.5 degrees Fahrenheit) warming of the Northern Hemisphere since 1880 is indisputable, as is the human influence on that warming, much else that passes as accepted fact is really a matter of probabilities. Figure SPM.1a. Annually and globally averaged combined land and ocean surface temperature anomalies relative to the average over the period 1986 to 2005. Colours indicate different data sets. Thus Stephens confused the global temperature with the temperature of the Northern Hemisphere. Not a biggy, but indicative of the quality of Stephens' writing. A related weird claim is that the "warming of the earth since 1880 is indisputable, as is the human influence on that warming, much else that passes as accepted fact is really a matter of probabilities." As quoted above the warming since 1880 is not exactly known, but probably between 0.65 and 1.06 °C. That it was warming is so certain that a journalist may call it "indisputable". There is thus no conflict between probabilities and certainty. In fact they go hand in hand. When scientists talk about uncertainties, they are quantifying how certain we are. However, I did not want to attack the soft target Bret Stephens. The hard target IPCC is much more interesting. They put some thought in their writing. 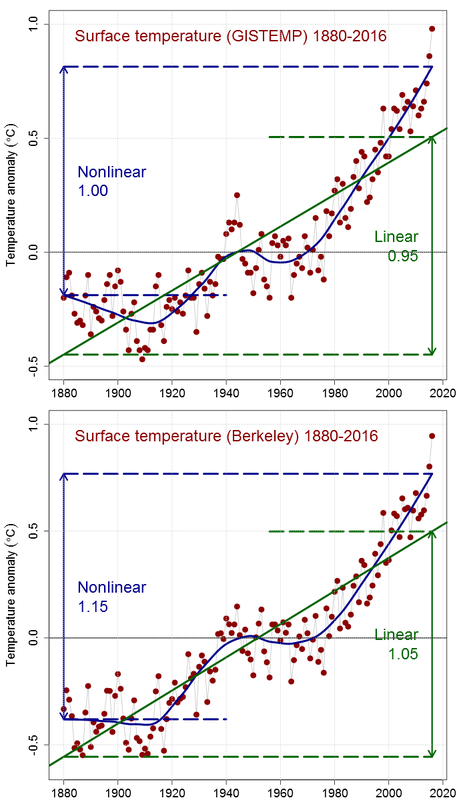 More precisely I have problems when they write in the summary for policy makers: "temperature data as calculated by a linear trend show a warming of 0.85". That means that they fitted a linear function to the data — using [[least squares regression]] — and used this trend and the length of the period to estimate the total warming over this period. This is a problem because calculating the total amount of warming using a linear trend underestimates global warming. * I show this below for two global temperature datasets by comparing the linear warming estimate with a nonlinear (LOESS) warming estimate. 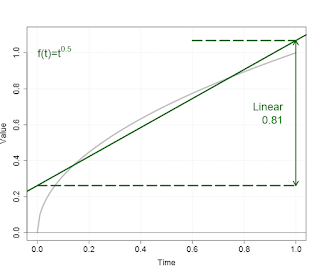 The linear estimate is smaller: For NASA's GISTEMP it is 0.05 °C smaller and for Berkeley Earth it is 0.1 °C smaller. 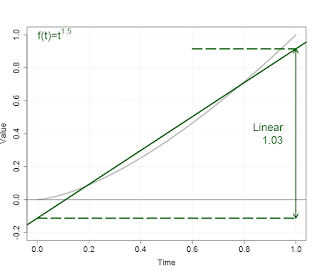 Such linear estimates are well suited for comparing different datasets because it is well defined how to compute a linear trend and the bias will be similar in the different datasets. 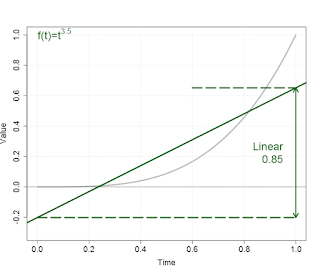 That is why linear estimates are used a lot in the scientific literature and scientists reading this know that a linear estimate can be biased when the curve itself is not linear. But this was a warming estimate for the summary for policy makers. Policy makers and the public in general should get an unbiased estimate of the climatic changes we have seen and are before us. Tending to underplay the problem is quite typical. There is even an article on climate Scientists Erring on the Side of Least Drama and also The Copenhagen Diagnosis gives several examples such as the very low predictions for the decline in sea ice or the increase in sea level. When it comes the warming found in station data, we did study the main possible warming bias (urbanization) in depth, but hardly did any work on cooling biases that may lead us to underestimate the amount of warming. In a recent study to define what "pre-industrial" means when it comes to the 2 °C warming limit, the authors suggest a comparison period with relatively few volcanoes, which is thus relatively warm. This underestimates the warming since "pre-industrial". The authors wanted to be "conservative". I think we should be unbiased. I understand that scientists want to be careful before crying wolf, whether we have a problem or not. 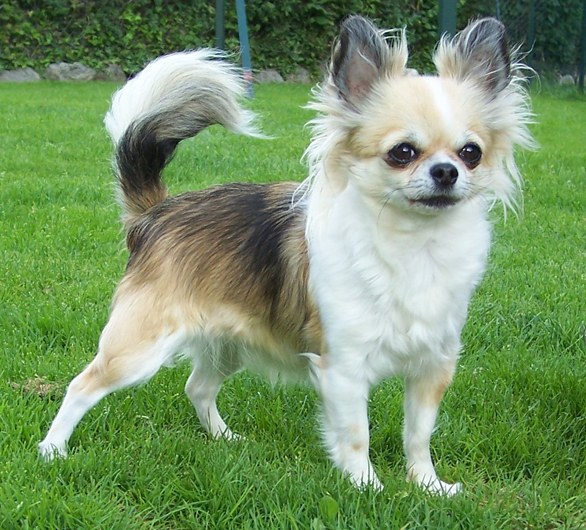 However, when it comes to the size of the wolf, we should give our best estimate and not continually err on the side of a Chihuahua. 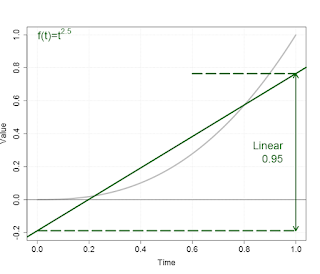 * The linear estimate is typically smaller, sometimes a lot, whether the actual underlying function is convex or concave. 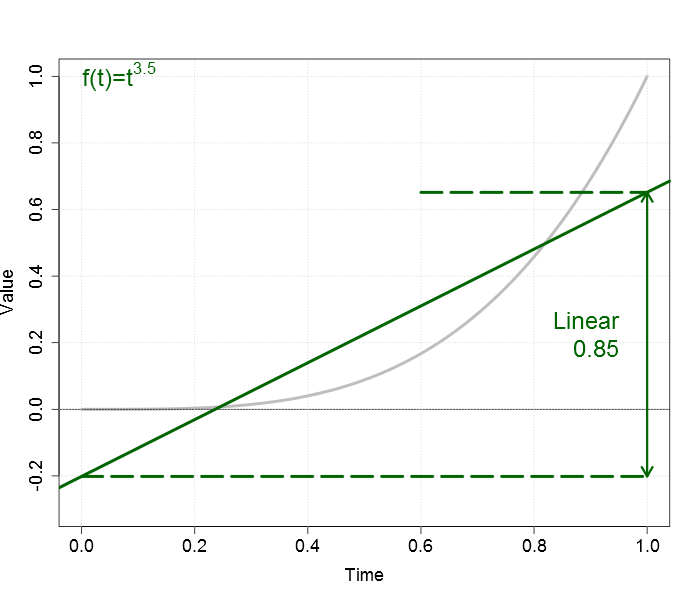 I had expected this estimate to be always smaller, but noticed while writing this post that for polynomial functions, f(t) = tp, it can also be a few percent higher for p between 1 and 2. Below you can see 4 example curves, where the time runs between zero and one and thus also f(t) goes from zero to one. The total "warming" in all cases is exactly one. 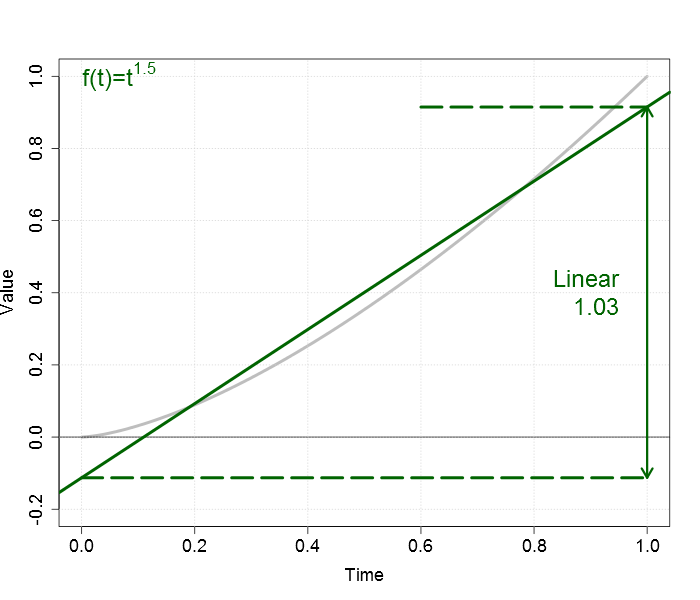 The linear estimates are generally less than one, except for the f(t) = t1.5 example. 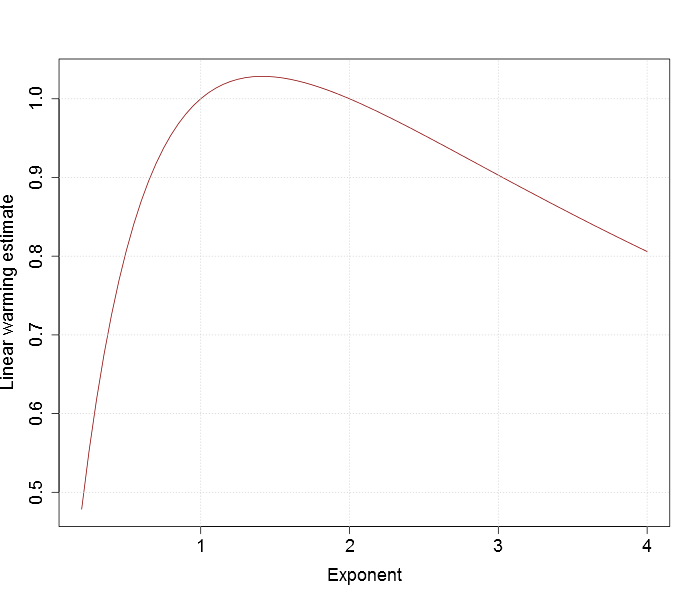 The bottom graph shows these linear estimates as a function of exponent p, where you can see that for an exponent between 1 (linear) and 2 (quadratic) the estimates can be a little higher than one, while they are generally lower. Probably Carl Friedrich Gauss or at least Paul Lévy already wrote an article about this, but it was a small surprise to me. 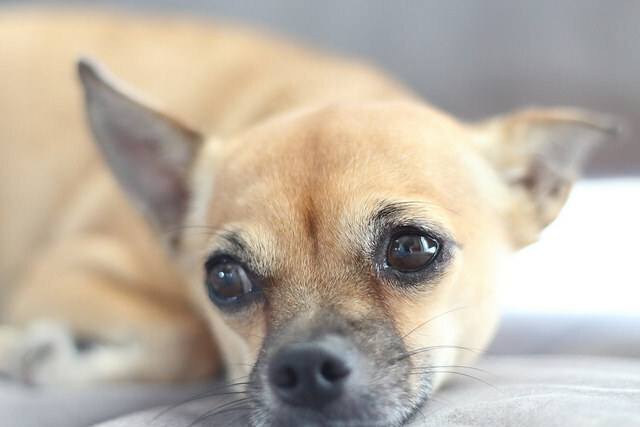 ** Top photo of a Chihuahua is licensed under the Creative Commons Attribution 3.0 Unported license. Bottom Chihuahua photo by Inanishi is licensed under the Creative Commons Attribution-NonCommercial-NoDerivs 2.0 Generic (CC BY-NC-ND 2.0) license. 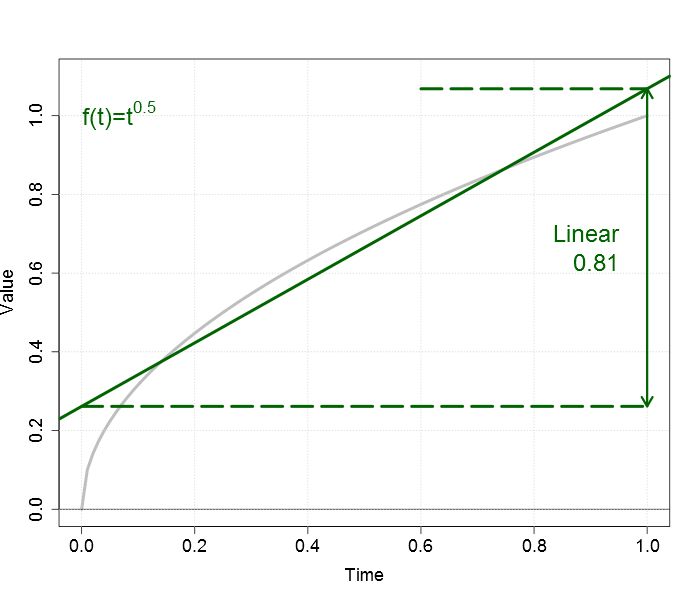 *** The R code to generate the plots with the linear and nonlinear warming from two global temperature datasets is on GitHub. 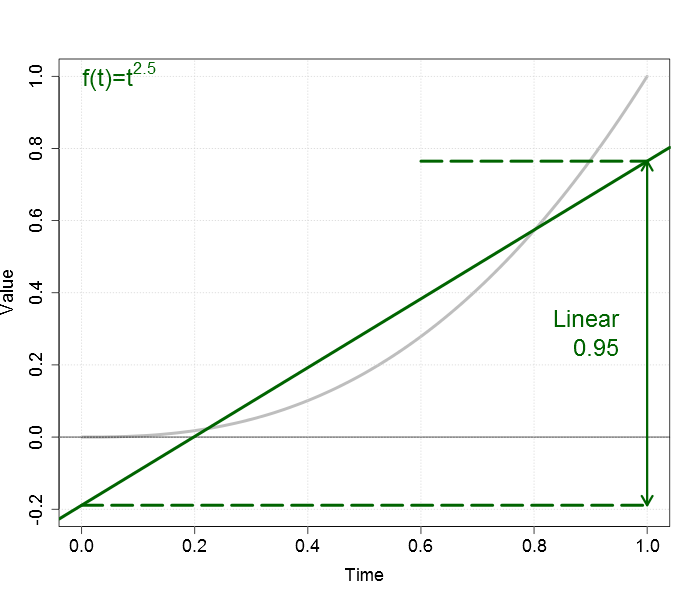 The R code to study the influence of the polynomial exponent on the linear estimate is also on GitHub. NBC News: Trump Interview With Lester Holt: President Asked Comey If He Was Under Investigation. And admits that his Clinton story about Comey’s firing was an excuse at best. Mother Jones: What the Hell Is Going on With Trump's Delay on the All-Important Paris Decision? Ivanka saves the world? Hah.